I’ve noticed that all my clothing seems to be in rather muted colours at the moment so I need something bright and hence the Cap-sleeved Cardigan from ‘Love to Knit’ by Bronwyn Lowenthal. 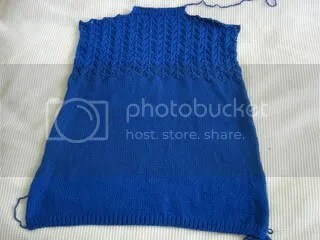 I’m using Lion Brand Microspun in royal blue and it’s a really strong colour – I love it! I’m already done with the back piece and I’ve started on one of the fronts. It’s pretty quick and easy although I have managed to mess up the lace on more than one occasion. And even more colour. 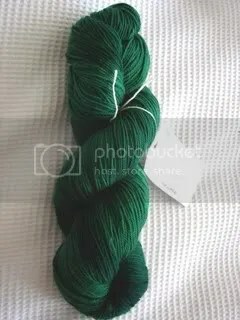 I went to the LYS for a long overdue visit and I found some amazing sock yarn, which was dyed locally. It’s from Tanis Fiber Arts and it’s superwash wool with some nylon in a great colour (the colourway is Mallard). I seriously love it. I now need to find a sock pattern to display it in its full glory! This photo doesn’t really show the beauty of the colour.